A man was found dead inside a burning vehicle on Gaffey Street on the southbound Harbor (110) Freeway in San Pedro Monday morning, authorities said. Photo via OnScene.TV. 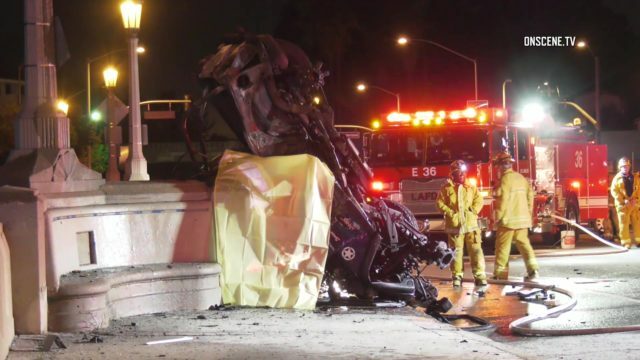 A 19-year-old man from Arizona was killed Monday when the Jeep he was driving crashed and caught fire on the southbound Harbor (110) Freeway in San Pedro. The man died at the scene of the crash, which occurred about 1:45 a.m. near Gaffey Street, according to the California Highway Patrol. Authorities withheld his name, pending notification of relatives. “According to witnesses, a dark-colored Jeep traveling at a high rate of speed southbound on I-110 just north of Gaffey Street struck two posted regulatory signs and a concrete wall,” according to the CHP. 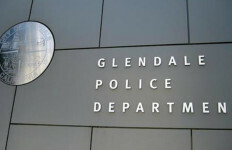 The motorist, who was alone in the vehicle, was not wearing a seatbelt, the CHP reported. The CHP issued a SigAlert shutting down the southbound lanes and diverting traffic onto the Vincent Thomas Bridge while an investigation was conducted. The freeway lanes were reopened shortly after 6 a.m., the CHP reported.